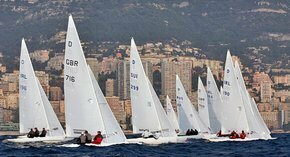 The crew of three makes for a tightly knit unit without the need for hired heavyweights, One Design rules ensure level racing and the ease of trailing makes international competition attractive to all budgets. Yet the Dragon's greatest strength is its depth of support. Dragons fresh from world class events line up the next weekend to do battle with their local fleets where keen club sailors provide a level of competition that can surprise the big names. The Dragon's philosophy of gradual evolution within one-design principles has produced a boat with state of the art rig and boat handling controls, reducing the learning curve for sailors transferring from other classes and making the boat flexible enough to cater for every level of ability. The Dragon class remains one of the few top level racing classes where sailing skills still predominate over crew weight and fitness. These are just some of the reasons why yachtsmen of every age and every standard are attracted to the Dragon. One sail is enough to make Dragon ownership the goal of many sailors' racing careers, while for others the class provides a lifetime of challenges. 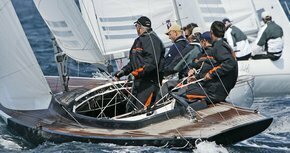 The International Dragon, A truly thoroughbred racing yacht.